Smiley vibration dampeners, give your racket some personality. Silica gel material with light weight offers a great dampening feel. Protect your arms from harmful shock and vibration. Great for used on all tennis and squash racket, perfect reward for kid’s lessons and quick-start tennis play. Per package includes 9pcs smiley vibration dampeners: 3 red + 3 yellow + 3 blue. 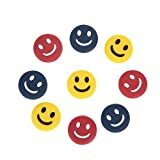 9Pcs smiley tennis racket vibration dampeners to decrease shock and protect your arms from harmful shock and vibration.